And what would we do without YouTube and the like? It appears that YouTube has become the treasure chest of yesteryear’s music. Luckily for me, I was raised well with good music by my folks. Those artists I discovered through them lead me to more and more than I could have ever imagined. I can’t even tell you when the last time I listened to a new modern band was, to be honest. Allow me to introduce myself…I am Ms. Aurora Sans…get the play on words? Most don’t but hey-what can ya do? Us literary nerds..sheesh. Anyway…I am a burlesque perfomer, production manager and proprietor of The Red Hot Heathens. It was my love of art and history that lead me to find my creative outlet. For as long as I can remember I have enjoyed re-discovering old, new music. I started collecting records in my early twenties and continue to do so today. There’s nothing like the crackling sound of vinyl on the turntable. I proposed to the editors that I start a nostalgic rock column, re-introducing old bands that either were one hit wonders or just kind of fell in the cracks or unheard tunes from popular bands in the 50’s, 60’s and 70’s…it will be an interesting journey, I think, one that will bring to the forefront the roots of rock and help us to all realize WHERE we get our taste and who is inspired by which musicians. 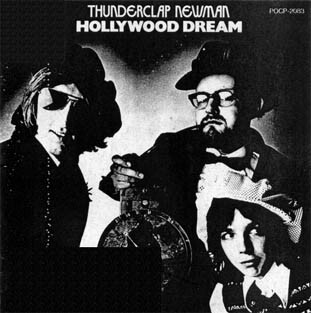 And for my first act… Thunderclap Newman… now what the hell kind of name is that, you say?! Hailing from the UK, T.N., as we’ll call it, one of the many one-hit-wonders of their time, sprang out in the post-flower power scene in 1969 with the first and only studio album, Hollywood Dream and hit single “Something in the Air.” Fronted by John “Speedy” Keen, The Who crony, Andew Newman, the honky-tonk master of the piano, and a young Jimmy McCulloch on guitar, they were fortunate enough to get Pete Townshend on bass. Their obvious era-sound is what made them fit so well in such a profound period in music history. I think the first time I heard this was i the Almost Famous film by legendary rock journalist, Cameron Crowe. “Open the Door Homer” was actually written by Bob Dylan. In my humble opinion, “Open the Door Homer” is very reminiscent of the later famous, E.L.O. Another tune of theirs that really spoke to me was “Accidents” (1970). Wow…talk about a real Beatles influence there, mixed with some Crosby, Stills, Nash, and Young’s, “Our House.” With their one and only reunion in February of this year, the only surviving member, Andy Newman, carried the torch with great success and a new lineup. That’s my first brief adventure…stay tuned for more…I will be enjoying this adventure just as much as you. Promise.